Images are copyrighted to their creators. Only use with written permission. Birds can be such show-offs! He sure knows how to strike a pose, though. Amazing view! WOW! - we've been in this area before - alas, without camera :( Incredible views! - especially from the top of the "Eagles Nest"! Great shot! I haven't been to Berchtesgaden in several years. Thanks for posting this picture of a most beautiful area. This is a fantastic photo -- especially with the addition of the bird. *V* OH! And have a happy and productive new year! I love the vista, and bird. It is real bagger, and great glider. Wonderful landscape. And the bird sit for a portrait. 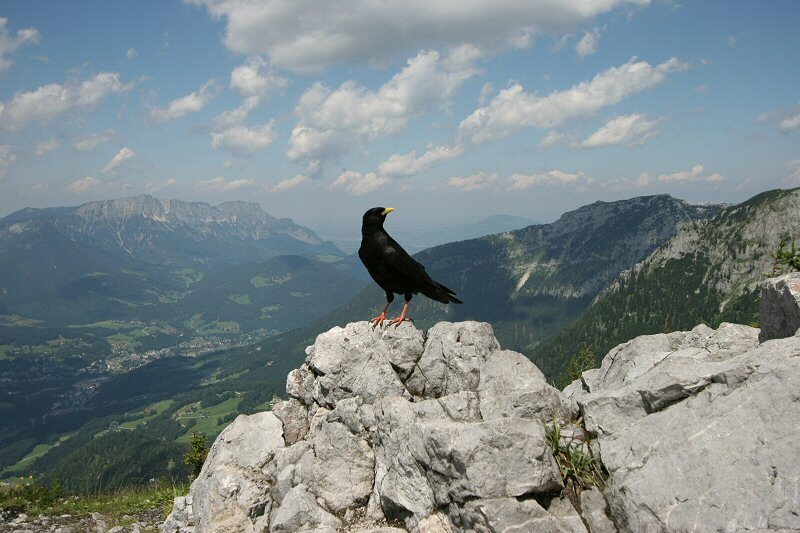 ......great composition - the sharply defined jet-black bird on the detail rock shapes really makes this photo snap!